The historic, post-Christmas rally struggled for a second day, with the S&P still unable to decisively cross the critical 2800 resistance level and sliding in a quiet overnight session, while European shares also faded after a mixed Asian session as investors await fresh catalysts on trade and monetary policy. Meanwhile, the dollar advanced for a sixth day as Treasuries edged higher. 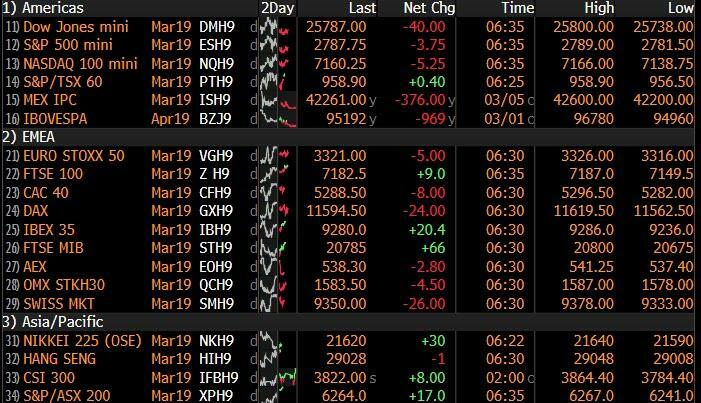 Carmakers fell and miners rose, leaving the Stoxx Europe 600 Index little changed with the DAX underperforming peers as auto names weigh alongside banks and insurance names with markets shrugging off a downbeat global economic assessment from the OECD. European banks were again hit by the ever-widening money-laundering scandal which seems to add more names with every passing day. On Wednesday, RBS said it was looking into allegations of money laundering through certain Dutch banks and reports this may concern an ABN Amro business line acquired by RBS. Investors can now add regulatory penalties to the list of bank sector worries after bank were the second-worst Stoxx 600 performer in 2018, hit by political uncertainty, a flattening yield curve, and low rates. That relative performance has continued to send the price ratio vs the Stoxx 600 lower this year, with the earnings season disappointing and consensus 12-month forward EPS estimates falling almost 4%. Unable to rise above 2,800 for two weeks in a row, S&P 500 futures had no other choice but to decline. 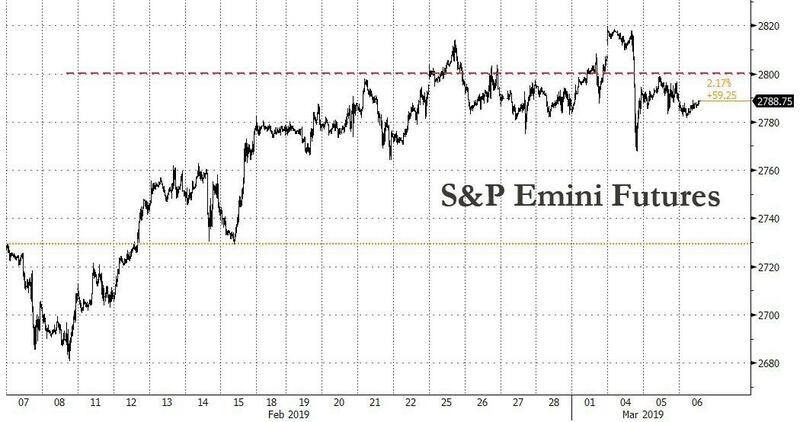 Eminis have now been trading in a tight, 20 point range since mid-February. Earlier in Asia, a familiar pattern emerged as Chinese shares once again outperformed as the local stock bubble is rapidly scrambling to recreate its 2015 majesty while Japanese equities dropped. 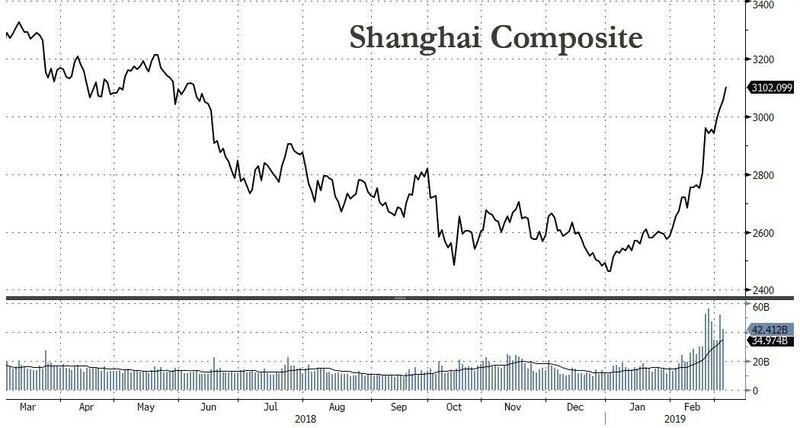 The Shanghai Composite surged another 1.6%, rising above 3,100 after the last hour ramp perhaps the result of China's National Team attempts to herd even more mom and pop investors into the rising momentum. Volumes were again massive, with over 1 trillion yuan trading on Wednesday. Elsewhere in Asia, RBA Governor Lowe reiterated his neutral stance nothing that the RBA has flexibility to adjust monetary policy in either direction, probabilities of a rate hike or cut are evenly balanced. He also stated it is hard to imagine a rate hike this year, and it is unlikely inflation will be a problem anytime soon. Lowe added that he is confident inflation will get back to the middle of 2-3% target range, Q3 and Q4 GDP likely to be significantly below trend. The AUD was hit hard when the Australian Real GDP for Q4 printed at 0.2% vs. Exp. 0.3% (YY Q4 2.3% vs. Exp. 2.5%). Investors remain jittery, looking for hints on what Trump will do next on negotiations with China as trade remains high on the agenda. Meanwhile, the bond market signals more caution and Morgan Stanley is now predicting Treasury yields will drop as low as 2.35% by the end of the year. Traders will also get a jolt from the ECB's policy decision today when Mario Draghi may announce the long overdue TLTRO. In rates, traders saw a pop higher in German Bund futures, with 10y and 30y yields initially -3bps as the curve bull flattened before gains were pared dragging USTs off the highs, while peripheral bonds tightened modestly to core. Gilt yields were ~2bps lower across the curve as Brexit anxiety remains elevated. The Bloomberg dollar index traded in the middle of its overnight range, stronger for the sixth day and defying Trump's latest dollar bashing. The pound weakened on speculation U.K. Prime Minister Theresa May could be in for another bruising vote in Parliament on Brexit, and the Australian dollar sank after weak GDP data on the economy spurred bets on interest-rate cuts. Emerging-market stocks gained for a fourth day and currencies were steady. In Central bank news, BoJ Board Member Harada (Dissenter) opposed the BoJ's new forward guidance due to the view that guidance must be data-dependent and not calendar-dependent. In his view, forward guidance must have a commitment to keep rate low until inflation beats expectations. He also said underlying inflation weakness could weigh on inflation expectations and delay the acceleration of inflation and despite the rising household income. In geopolitical news, North Korea was reportedly taken aback by the sudden end to the Trump-Kim summit; and it will take North Korea some time to review what happened; according to Korean press citing the South Korean government. US National Security Adviser Bolton said US will increase sanctions on North Korea if it does not move towards denuclearisation. In the latest Brexit news, EU and UK Brexit talks ended with no agreement but are to continue on Wednesday; according to sources. Furthermore, an EU official said the talks did not go well. A senior UK minister, who is directly involved in Brexit planning, said: "It's inevitable there would have to be a technical extension” and added that a month is unlikely to be enough, two months would be needed to get the legislation through, and this is accepted in government. If UK MPs reject PM May's deal a second time next week, parliament would take control and force a softer Brexit; according to Chief Whip Smith. Elsewhere, commodities were led lower by oil after API showed a massive buildup in U.S. crude stockpiles. Brent (-0.2%) and WTI (-0.9%) prices are in the red following the larger than expected build in API Crude Inventories yesterday of 7.4mln vs. Exp. 1.2mln. If the API build is confirmed by EIA data later on today this would be a large contrast to the prior draw. That said, UBS highlighted that a build of this size would not mean a major deviation from the seasonal average within the context of the prior two months data, as such should not result in a lasting impact on oil prices. Elsewhere, China have canceled Canadian Co. Richardson International registration to ship canola to China; following this, China’s foreign ministry state that harmful pests have been discovered in samples taken from Canadian Canola oil and a serious problem has been highlighted in one Co’s shipments. Although, it is currently not clear which company this refers to. Gold (-0.1%) is approaching the bottom of its narrow USD 4/oz range but is largely unchanged on the day. Elsewhere, the World Platinum Investment Council stated that the global platinum market will this year experience the largest surplus since around 2013. Besides the ECB, data on ADP private payrolls, mortgage applications, and the trade balance are due. Earnings include Dollar Tree and Brown-Forman.